Ellianna is a 21 year old summoner living in the Green Kingdom (Kingdom name for the lands claimed from the "Stolen Lands" in a Kingmaker Campaign). She wears her straight long brown hair in two wide pony tails that spread out off the sides and down past her back. She has an average complexion from alternating trips out adventuring and staying indoors for extended periods of time reading books or crafting. Her clothing tends towards the simple, a commoner's dress (with a childish appearance) underneath either a smith's apron or her All-Tools vest. Underneath, likely not visible to most, is a very light weight shirt of celestial chainmail. Hooked to the sides of her belt is a little china doll that resembles her sister (unbound Soul Doll), and her ornate adamantine dagger that she uses for crafting and killing bad guys. She also has a very complex looking crossbow she constructed, with a ton of gears that resembles something out of steampunk. 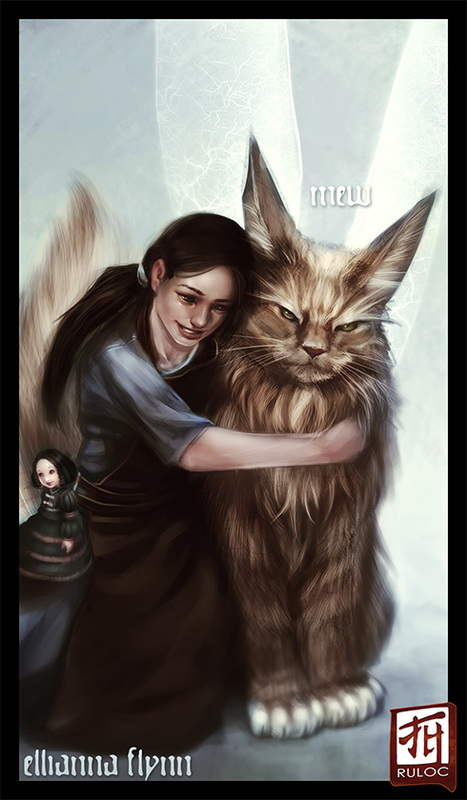 Her companion and best friend in her journeys is her Eidolon "Mew". She refers to Mew as her "Fluffy Planar Kitty" and is a large sized serious looking cat with the strength and claws of leopard or panther, but the looks of a fluffy cat with overly long ears (anime elf sized) and gossamer wings.